This paiting is of "Mary Ann 11" located at Jesse Haywood Dock in beautiful Mathews County, Virginia. Availible as a limited edition Giclee print, signed and numbered by Jane Partin. 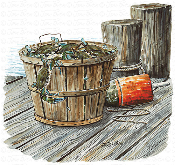 This painting of a basket of fresh crabs on the Chesapeake Bay is available as a limited edition print, signed and numbered by Jane Partin. image size ....7" x 13 1/2"
This waterfront scene of a man and his Black Labrador on the Chesapeake Bay is available as a limited edition print, signed and numbered by Jane Partin. This painting of Linda Carol "Glory Days" is a limited edition Giclee print, signed and numbered by Jane Partin. 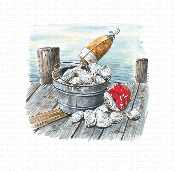 This painting of fresh clams on the Chesapeake Bay is available as a limited edition print, signed and numbered by Jane Partin. This scenic view of Mitchem's Dock on Horn Harbor Creek, Chesapeake Bay is available as a beautiful limited edition Giclee print, signed and numbered by Jane Partin. This is an old scenic view of Owens Dock and the Thomas E. boat on Mobjack Bay, Mathews County. It is available as a limited edition Giclee print, signed and numbered by Jane Partin.